Have a question? Take a look at the most common questions that we receive, compiled by our Customer Service team. If you cannot find what you’re looking for, send us an email at info@nbforum.com or give us a call at +358 20 775 1390 (Finland), +46 8446 811 61 (Sweden), +47 21 99 94 72 (Norway). What is Nordic Business Forum? Nordic Business Forum is an international conference organizer committed to building leaders that change the world. We cater to CEOs, business executives, and entrepreneurs alike, and host world-class business conferences in Finland, Sweden, and Norway. Our attendees benefit from educational lectures by some of the world’s foremost business experts, and have the opportunity to network with a diverse, high-level international crowd. What are the differences between the event tickets? 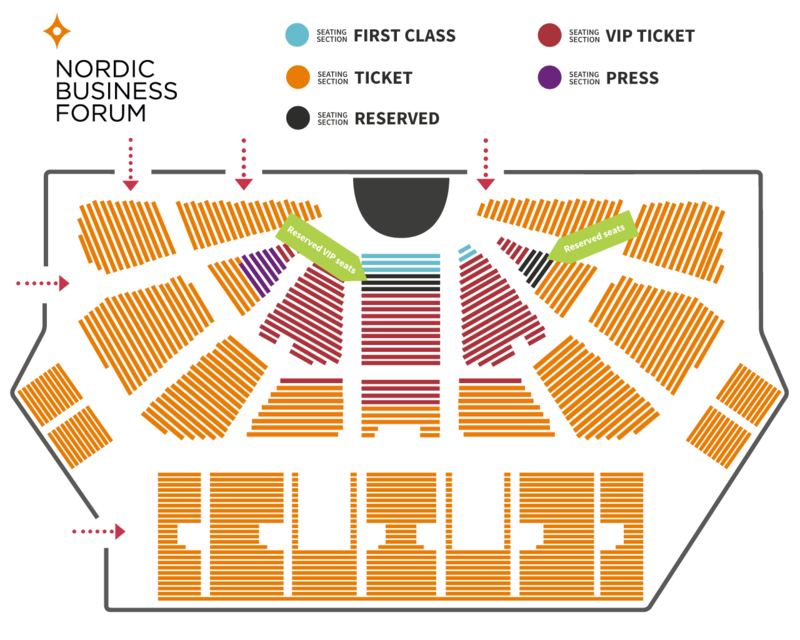 We have several ticket categories, some of which are only available for specific events, so be sure to check the exact information on the event page that you wish to attend: NBForum 2019, NBFNorway 2019, and NBFSweden 2019. “Add-on services” are extras that are available for purchase with your ticket to enhance your conference experience. We currently have two add-on services for you to select. Reserved Seating: This option gives you a seat cover. With a seat cover, you can reserve a seat in the seminar hall for the entire two-day conference. This is the only way you can “save” your seat in the seminar hall as we will remove all personal belongings when we clean the hall during program breaks. Split Ticket: This option allows you to separate a two-day ticket into “Day 1” and “Day 2” tickets for different attendees. The additional cost for this feature accounts for the extra materials and food (if special diets apply) required for different attendees, as well as the administrative fees involved in the process. Please note: If you purchase multiple tickets and would like your selected add-on services to apply to all your tickets, you will need to have an equal number of add-on services selected. Can two people use one ticket? Yes, this option is available for purchase under the “add-on services” when ordering your tickets. Look for the option called “Split Ticket” – this allows you to separate a two-day ticket into “Day 1” and “Day 2” tickets for different attendees. Please note: If you purchase multiple tickets and would like to split them all, you will need to have an equal number of “split tickets” selected. Can I choose my seat in the seminar hall? We don’t assign seats for each ticket, but we do have an “add-on service” for “Reserved Seating” available for purchase with your order. Selecting this service will give you a seat cover with which you can keep your seat in the seminar hall for the entire two-day conference. This is the only way you can “save” your seat in the seminar hall as we will remove all personal belongings when we clean the hall during program breaks. Please note: though you cannot pick your specific seat, all reserved seats are located in a specific area in the seminar hall according to your ticket category for easy access. Can I reserve a seat in the seminar hall? Yes, anyone with an NBForum 2019 ticket can purchase a reserved seat for 150 € + VAT per seat. All reserved seats are located in a specific area in the seminar hall (see below) according to the customer’s ticket category for easy access. Further instructions will be sent to you before the event. Please check with your group leader (the person who bought the ticket for you) if your group already has reserved seats. All three of our events are centrally located in each of their respective cities. To find out more, please visit the specific event info pages: NBForum 2019, NBFNorway 2019, and NBFSweden 2019. We have up-to-date schedules on all our event pages: NBForum 2019, NBFNorway 2019, and NBFSweden 2019. Information on possible accommodation can be found on our event pages: NBForum 2019, NBFNorway 2019, and NBFSweden 2019. We deliver all our tickets by email to the address associated with the purchase. This means, if you bought the ticket yourself, you should have received your ticket by email. If you are part of a group and did not buy the ticket yourself, you should check with your group leader – he or she received all the group tickets by email. Please have your ticket ready to show our Customer Service representatives at the check-in desks. We accept both PDF tickets on your phone (recommended) and printed tickets. I bought multiple tickets. Do I need to know who is using each ticket before the event? Yes, if you buy more than one ticket, you are classified as a group leader and you are responsible delegating tickets to group members of your choosing through our online platform. As a group leader, we will send you a link to an Attendee Dashboard where you can fill in the name, contact information and special diets of each attendee in your group (and send them each their ticket). We require all tickets to be assigned at least 30 days before the event to be able to communicate all the information to your group and to make sure their special dietary needs are met at the event. If you communicate special diet information less than 30 days before the event, we cannot guarantee that your order has been noted by our catering staff. Brella is a free networking app that connects you with other seminar guests, attending in person or virtually. Use the mobile and/or desktop platforms to arrange 15-minute meetings based on your common interests. Our “join codes” are event-specific, and we have a separate code for our Live Stream viewers so they can arrange phone calls and video chat sessions. For more detailed information, please check the information for specific events: NBForum 2019, NBFSweden 2019, NBFNorway 2019. I’m interested in speaking on stage at Nordic Business Forum events. Is that a possibility? We are hosting a Speaker Contest. For more information, visit our website and submit an application! Where can I see NBForum’s Code of Conduct? Our mission is to build business leaders who change the world. This starts by making sure that all participants, speakers, organizers, and partners of the event are friendly and create an atmosphere that is welcoming and safe. Let’s make this event an enjoyable learning experience for everyone involved! You can cancel your purchase within 30 days from the day the order is placed. If you wish to do this, please contact us at info@nbforum.com. Only written cancellations are accepted. Please note: an unpaid invoice is not considered as a cancellation. Cancellations made less than 30 days before the event will not be accepted. For more information, see our Cancellation Policy. Yes. Transferring your ticket can be done by updating the attendee information on the Attendee Dashboard. If you have any further questions, contact us at info@nbforum.com. I’ve been notified that I am on the waiting list. What does that mean? If you’re on our Waiting List, it means that the ticket(s) you were trying to purchase are currently sold out. If any tickets in your chosen ticket category become available, we will process your request and send you an order confirmation and invoice accordingly. The price of your ticket will match the price at the time you joined the waiting list. Our Waiting List is a binding request for a ticket, and we will process your order automatically when the ticket(s) become(s) available. Please contact us at info@nbforum.com if you no longer want to be on the waiting list. I was on the waiting list but have been charged for a ticket. Why have I received this invoice? Our Waiting List is a binding request for a ticket. As soon as your order becomes available, we will process it as usual and send you both an invoice and the email confirmation. It is important to note that this ticket is subject to our Cancellation Policy without exception; you can cancel your ticket within 30 days of the date of the order. Please note: cancellations made less than 30 days before the event will not be accepted. Why has the schedule/lineup changed? This could be due to a number of reasons, for example, if a speaker is unable to participate due to a medical emergency or the termination of employment. We host multiple speakers at our events and, although rare, we reserve the right to make changes to our event schedules and lineups. Individual changes are not a valid justification for cancelling your ticket for a refund. For more information, see the “Organizers Rights” section of our Terms and Conditions. The VAT added to each order works in compliance with the laws of the country in which the event takes place. For example, a ticket to Nordic Business Forum NORWAY will be subject to Norwegian VAT. The standard VAT rates are 24% in Finland, 25% in Sweden, and 25% in Norway. More information on the VAT rules for live stream and tickets below. I bought a Live Stream license. Can you send my company an invoice without VAT? All Live Stream licenses are invoiced by Nordic Business Forum Oy in accordance with the EU VAT regulation for digital services. The standard VAT rate in Finland is 24 %. For Finnish customers established in Finland, 24% VAT is included in the invoice with no exemptions. For customers outside the EU and for VAT registered organizations from another EU country: no VAT is invoiced. Please note that we require a valid VAT number to issue the invoice with 0% VAT reverse charge. For EU-based consumers or companies without a valid VAT number, invoices are issued with the purchaser’s home country VAT. I bought a ticket. Can you send my company an invoice without VAT? In general, no. VAT is always added to the ticket price even when the purchase is made by a company. The exact VAT depends on which of our events you have bought a ticket. Below is some event-specific information, and you can contact our Customer Service team for further information. When the service is sold in Finland, it is also taxed in Finland – and companies are no exception. (Applied from AVL 69 d §). As the flagship Nordic Business Forum is held in Helsinki, VAT is always added to the ticket price. The standard VAT rate in Finland is 24%. Companies from other EU countries, please contact your local tax office to apply for a VAT refund. All Swedish companies and consumers will be charged Swedish VAT. The standard VAT rate in Sweden is 25%. If the invoice of your ticket(s) goes to a foreign, VAT-registered company in another EU country, you will receive your invoice without Swedish VAT. Instead, the purchaser should report output VAT on his or her purchase according to the reverse charge principle in the purchaser’s country. To be able to invoice your company without VAT, the order needs to include the company’s VAT number. If the invoice of your ticket(s) goes to a company established in a non-EU country, you will also receive your invoice without Swedish VAT. As a business event that takes place in Oslo, tickets to Nordic Business Forum NORWAY are subject to Norwegian taxes. The standard VAT rate in Norway is 25%. We offer three payment methods: invoicing, online bank, and credit card. The credit card and online bank options are provided by Paytrail (Finland), DIBS (Sweden), and STRIPE (Norway). If you want an invoice, you can choose between an email or printed invoice. E-invoices are available when issued by Nordic Business Forum Oy for Finnish companies, and Nordic Business Forum AS for Norwegian companies. Payments can also be made with PlusGirot, the Swedish payment transaction system provided by Nordea, for customers who have a transaction account with a PlusGiro number. Please check that your invoicing information is correct and up-to-date. For Russian customers, we also offer Russian invoice in Rubles, along with other required documents. Can I choose the currency for the invoice? If you buy tickets to our flagship event, Nordic Business Forum in Helsinki, the invoice will be sent in euros. For Russian customers, we also offer Russian invoice in Rubles and with the needed documents. The invoice will be sent to you by Nordic Business Forum Oy (FI24748179). If you buy tickets to Nordic Business Forum Sweden, the invoice will be sent in Swedish crowns. The invoice will be sent to you by Nordic Business Forum AB (SE559044650501). If you buy tickets to Nordic Business Forum Norway, the invoice will be sent in Norwegian crowns. The invoice will be sent to you by Nordic Business Forum AS (NO919145471). All Live Stream license invoices are issued in euros by Nordic Business Forum Oy (FI24748179). Yes, your information is completely secure. All transactions are encrypted and processed on Paytrail, DIBS, or Stripe servers. We do not store any credit card details on our servers. Where do I find Nordic Business Forum’s bank details? You will find country-specific details on our Contact Us page. I’m attending NBFNorway and there is a KID number on my invoice. What is it? A KID number is reference number specific to the Norwegian invoicing and banking systems. How do I fill in the attendee information ahead of the event? Our ticketing partner, Kongressi, has an “Attendee Dashboard” on which all the attendee information is stored. You will have received a link to this dashboard by email when you purchased your ticket(s). To access it, simply click the link in the email (or copy the URL into your browser). What is a “group leader”? Group leaders are people who have purchased multiple tickets. These people are responsible for delegating tickets to group members of their choosing through our online platform. Group leaders will receive a link to an Attendee Dashboard where they can fill in the name, contact information, and special diets of each attendee in their group (and send them each their ticket). Please fill in this information at least 30 days before the event. We encourage you to decide on who you would like to invite to the event as soon as you can. If you communicate special diet information less than 30 days before the event, we cannot guarantee that your order has been noted by our catering staff. Why am I receiving emails from Nordic Business Forum? You are receiving emails from us because you have purchased a ticket, a ticket has been assigned to you by someone else and/or have subscribed to our Monthly Letter. Our emails usually contain information that is relevant to our events, important updates that we want you to know about, or news about our company. We value your privacy and will not distribute your email address to third parties without your consent. Why haven’t I received any emails with event information? If you have purchased a ticket, we have your contact information and you should be receiving emails from us. Check your spam filter to see if you have missed our emails. If you have not received anything, please contact us at info@nbforum.com and we will add you to the list! If you are attending the event as part of a group and did not buy the ticket yourself, your group leader is responsible for adding your information to our database. Please contact your group leader if you have not received any emails from us. I have a special diet. Who should I contact? You can enter your dietary requirements on the Attendee Dashboard (link sent via email along with the order confirmation). Please do this at least 30 days prior to the event. Otherwise, we cannot guarantee that your order has been noted by our catering staff. If you have any questions or concerns, please contact info@nbforum.com. You need to show your ticket (and your ID) to our Customer Service representatives at the check-in desks. This will let you collect your seminar pass. Don’t panic – first, make sure you have checked your email for your ticket. You will have received it by email from us, so search for the subject “Your Ticket”. If you still can’t find it, ask one of our Customer Service representatives for assistance. If we have the correct attendee information in our database, you’ll be able to collect your seminar pass to enter the conference with your name and ID. Please note: it’s important to make sure that the attendee information on the Attendee Dashboard (link sent by email) is always up to date. If you have any further questions, contact us at info@nbforum.com. Where can I collect my seminar pass? To enter the event, every attendee will need to collect their seminar pass upon arrival from our check-in desks, located at the entrance of our conference venues. For more detailed information, please check the information for specific events: NBForum 2019, NBFSweden 2019, NBFNorway 2019. Can I enter the event without my seminar pass? No, for security reasons, only guests with valid seminar passes will be allowed into the conference hall. For this reason, we urge you to take good care of your seminar pass and keep it with you for the duration of the event. Every year, we find that some people forget their pass on day two of Nordic Business Forum (Finland). Please remember to take it with you, otherwise, you won’t be allowed inside. We suggest that you bring your ticket, ID, and business cards with you, as well as anything else that would help you make the most of your time at the conference. Chargers are hard to come by, so a power bank to charge your phone or tablet would also be useful! Also, we don’t have a specific dress code for the event – business casual is the most common choice – but we do recommend wearing comfortable shoes. Yes. All tickets include lunch, coffee breaks, light snacks, and other non-alcoholic beverages. VIP and First Class tickets also include catering and beverages during the evening program. You can see some of our other attendees on our Facebook page. For networking purposes, we recommend that you use Brella, our official networking app. With Brella, you can easily book meetings with other event guests. For more detailed information, please check the information for specific events: NBForum 2019, NBFSweden 2019, NBFNorway 2019. English is not my strongest language. Do you offer simultaneous interpretation at your events? For our Helsinki event, yes! We offer translations of the main stage presentations into Finnish, Estonian, and Russian. Does the Live Stream cover the full conference? Please check the specifications of each event when purchasing a live stream license for the full details of each event broadcast. If a speaker has not given us the right to include his or her session in our broadcast, it will be clearly stated on our website. What is the Nordic Business Forum Live Stream? Our Live Stream Service is our native viewing platform. When you buy a license to access the broadcast, you are able to watch the full conference, including interviews with the speakers from our Live Stream Studio directly from the seminar hall and also for 30 days on demand after the event. Please note that President Barack Obama’s session is available live via a free license, and not included in the on-demand videos. What is a "season pass"? Our season passes are live stream licenses that give you access to all our online content for a particular year. For example, our 2019 season pass gives you access to our high-quality, live broadcasts from all Nordic Business Forum events in 2019. Please note: Your season pass is renewed for the following year automatically, but it can be canceled within the 30-days cancellation period. Most of the keynotes are also available on-demand for 30 days after each event. What are the differences between the license types? We have two types of licenses: individual and community. Individual Licenses are meant for private viewings by one person (only). This license gives you the flexibility to watch the live stream from anywhere with a steady internet connection. Community Licenses are intended for two or more people watching the broadcast. You need this license if you’re watching with a group of friends, customers, employees, colleagues, students, etc. Do I need to download anything to watch the broadcast? No, you do not need to download anything to view the live stream. The video plays automatically from within your browser. It works on PCs, Macs, tablets, and smartphones. For the best quality and reliability, we recommend a 10Mb/10Mb Ethernet connection, but any proper WiFi connection or even mobile data connection will work. You can check your internet speed at http://www.speedtest.net. Please be aware that we are not responsible for any additional charges associated with your data connection. I'm organizing a Community Live Stream event. How does it work? Can I buy the Live Stream license in advance? Yes, and we encourage it! We recommend that you purchase your Live Stream license ahead of time to avoid the virtual line (yes, even on the internet, there are queues). If you’re prepared with your login information, all you have to do on the day is head to live.nbforum.com, sign in to your account, and start watching the broadcast. If you’d like to test it, you can connect a few minutes before the show to test the connection. Our Live Stream Customer Service team is able to help you troubleshoot any issues that come up. Where can I find the Live Stream Terms and Conditions?